Custom home audio and video brings in another level of luxury living. When you’re able to experience your music, sports, or movies throughout any and all areas of your home, your leisure time becomes far more enjoyable, and so does your entertaining. MediaTech Living offers a vast array of solutions for your audio and video needs, and the sky’s the limit with what we’re able to customize and install. Are you a lover of music? If you’ve ever found yourself frustrated at being unable to hear your favorite tunes when moving from room to room in your house, a multi-room audio system from MediaTech is the answer. Listen to your music in any single room or enjoy it in a combination of rooms and spaces so that you can take it with you seamlessly. Want to relax on the back deck while enjoying your favorite playlist? That’s not a problem, either. Our custom home audio systems allow you to listen to your music indoors and out at the touch of a button. Custom home video systems from MediaTech allow you and your family to enjoy any live or recorded video in seconds from anywhere in your house. Whether you’re watching the big game in your media room or your kids are watching Netflix on the back patio, our customizable solutions move easily with you. 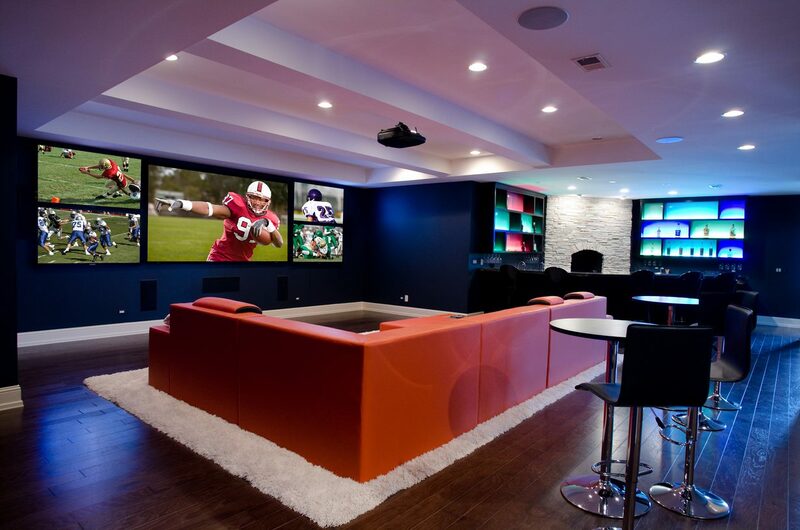 By installing a custom home video system, you’re able to transition freely from one room to the next without worrying about missing the biggest play of the game or waiting for commercials. Enjoy features that allow you to start a movie in your home theater and then route it to the kitchen while you prepare a mid-movie snack. Sports fans love our multi-window video processors that allow you to monitor four or more games at once from a large-screen television or projector. A mirror TV. Wall‐mounted flat‐screen TVs disappear completely into a beautiful mirror in a formal living room, bedroom, or even into the vanity in your bath. We can install mirror televisions from 32” to 80” diagonal, appropriate for any room. A framed art TV. Popular above fireplaces and in offices and family rooms, these flat‐panel systems hide behind artwork which slides into the wall to reveal your television screen. Cabinets with lifts. A large, flat‐panel TV can also disappear into a cabinet when not in use. There are a wide variety of styles available, or we can have a custom cabinet built to match your furniture exactly. Invisible Speakers. Music seemingly comes from nowhere with the installation of invisible speakers. Drywall surface speakers are installed and then finished over with the surrounding surface. Our invisible speakers can be painted, papered or even adorned with wood veneer to blend in perfectly with your home. Interested in a customized solution for your home? Find out more about the custom home audio and video solutions from MediaTech Living. At MediaTech Living, we work with the best product providers in the industry to offer you the highest quality experience imaginable. All of our audio and video services come with 24/7 emergency service, extended maintenance agreements, and a one-year warranty. Contact us for a free consultation.